Welcome to the new USDA Foods E-Letter! The USDA Food and Nutrition Service's Food Distribution Division is delighted to announce the launch of our new "USDA Foods from Farm to Plate" e-letters! We will be sharing resources, news, and best practices for all of our programs. Each month we will send out a letter, rotating among this general "all programs" letter and a trio of program-specific letters: "Spotlight on Schools," "Household Highlights," and "FDPIR Connection." These letters are part of our USDA Foods communications strategy which also includes webinars and blogs. We would appreciate your input on topics you would like to see covered in future letters and webinars as well as any feedback you have on this first edition. You may contact us through our USDA Foods mailbox at USDAFoods@fns.usda.gov. We are sending this first letter out via the FNS Regions and State agencies, but to receive future letters you will need to sign up via GovDelivery. See the last section below for instructions on how to sign up! Looking for basic background or further training and tips for USDA Foods? The latest addition to our USDA Foods Toolkit is a Quick Start Companion guide which provides you with information on how to access four training modules available for free through the National Food Service Management Institute! USDA Foods Primer 1, USDA Foods Primer 2, Life Cycle of USDA Foods, and USDA Foods Processing 101 are webinars-turned-courses that delve into the history and operations of USDA Foods for a school audience. We are planning webinars for both schools and household programs in 2015. Register here for our February/March series on USDA Foods topics for school programs - from entitlement and inventory management to nutrition and the agricultural market - and stay tuned for details on future webinars! The USDA blog has recently featured the nutrition education activities of the Mississippi Band of Choctaw Indians and the Menominee Indian Tribe of Wisconsin, recipients of 2014 Food Distribution Program Nutrition Education (FDPNE) grants. Read excerpts of USDA staff site visits below, and click the links for the full story. 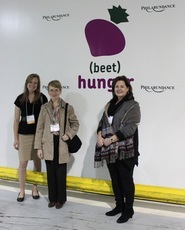 (beet) hunger: Program Analyst Carolyn Smalkowski, Food Distribution Director Laura Castro, and Deputy Administrator for Supplemental Nutrition and Safety Programs Diane Kriviski tour the Philabundance food bank in Philadelphia, Pennsylvania as part of the National Commodity Supplemental Food Program Association conference in October 2014. The 2014 Farm Bill phased out the participation of women, infants, and children in CSFP, transitioning it to a low-income, seniors-only program. Whole Grain Squares, a 100% whole grain ready-to-eat cereal, were added to the food package. The CSFP Inventory Calculator, allowing State agencies as well as Regional and National Office staff to calculate month-on-hand inventory levels for each food package category, is available for download, with instructions and a training webinar, on the CSFP homepage on the FNS website. Representatives from State and local agencies implementing CSFP also provided USDA staff with valuable feedback during the conference sessions. USDA presentations are available for download here. When you try a new recipe, the feedback you receive from family and friends, as well as your own taste buds, will likely determine whether you add the recipe to your repertoire or tweak the ingredients the next time around. Taste, texture, and appearance all influence a dish’s acceptability to its consumers. Did you know that the USDA Foods offered through the National School Lunch Program (NSLP) undergo a similar process, just on a larger scale? Here’s a behind-the-scenes look at how nutritionists at USDA improve our products based on feedback we receive from schools and chefs. While cooking is an art, it is also a science. Each of the 200 plus products on our Foods Available List has a set of specifications outlining ingredients and other requirements for manufacturers, based on industry standards and food science. Based on the orders we receive from schools, vendors submit bids to provide the product. Our partner agencies, the Agricultural Marketing Service and the Farm Service Agency, work with the Food and Nutrition Service on the procurement process. Let’s look at salsa as an example of how USDA revises specifications based on consumer experiences. Receiving agencies may submit feedback through our ordering system, Web-Based Supply Chain Management (WBSCM), regarding product acceptability and other topics. We also hear anecdotes about our foods informally through the grapevine…or, shall we say, the tomato vine. Chef Cyndie Story, a consultant and trainer for schools across the country, has witnessed the transformation of USDA salsa over the past few years. A school employee in Oklahoma, concerned that children were not taking the salsa, asked her simply, “Can you help us fix this?” Chef Cyndie worked with the school district to ship a can to USDA to see what could be done. To improve the color and increase the thickness of the salsa, our nutritionists modified the specification based on vendor input to increase the percentage of tomato solids. 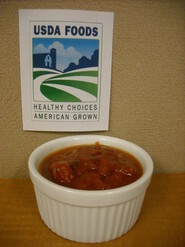 Now vendors must follow this new “recipe” so that the salsa consistently provides more acceptable thickness and color. At the start of this school year, Chef Cyndie came across a can of salsa. Initially skeptical, she was delighted to open the can, see the improved contents, and hear that the school was reporting no issues with the product. Many school employees are not aware that they can submit feedback on USDA Foods products, and that USDA needs this important feedback to help identify potential problems and come up with creative solutions. When Chef Cyndie conducts trainings around the country, she encourages school nutrition professionals to speak up, stating, “You are the eyes and ears of procurement.” The workers on the front lines in America’s school cafeterias can provide valuable feedback to help our team improve the offerings available to schools. Do you have ideas for how we can improve our USDA Foods? We would love to hear from you! You can send your comments to USDAFoods@fns.usda.gov. Historically the DoD Fresh Fruit and Vegetable Program web application (FFAVORS) used by schools, school districts, and tribal organizations has had the feature of an ‘Automatic Goods Receipt.’ This feature automatically receipts an order 5 business days past its scheduled delivery date. In a recent DoD audit, the automatic process was found to be insufficient. For this reason, DoD is requiring that any automatic receipting process be removed, and thus requiring each order to be manually receipted. While other DoD applications have implemented this change, the FFAVORS application will use a phased in approach. The first phase, scheduled for March, will lay the ground work at the database level for the application to identify those orders not receipted with the 5 business day rule. Users of the application will also see a message on the main menu page informing them of a receipt that needs to be addressed. The message will remain until the order gets explicitly receipted in FFAVORS. The second phase of this project is scheduled for June. At that time, the system will prevent a user from placing a new order if they have an outstanding receipt; in other words, if there is an order with a delivery date of more than 5 business days, the ‘Place New Order’ function will not be active. Once the user has completed the receipt, the new order can be placed. This new requirement could also impact vendors. As the receipt action is required to send the data to the billing system, any order not receipted may delay vendor payment. Did you know the number of USDA Foods on the Foods Available List for schools has nearly quadrupled since 1981? 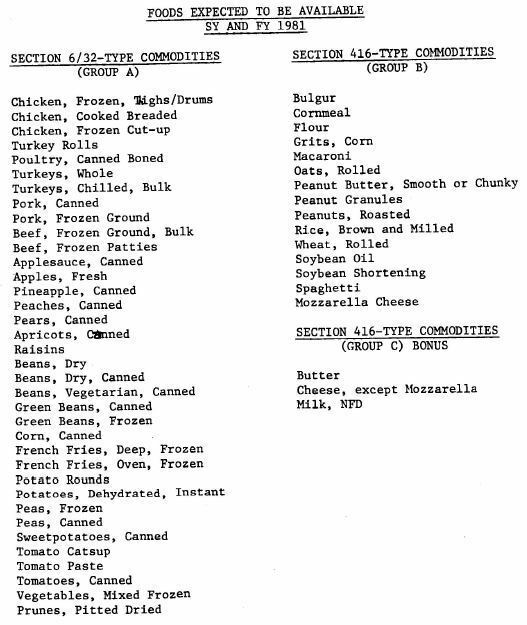 That list (pictured below) featured 54 commodities. The current list, now multicolored and multiple pages, contains more than 200 fruits, vegetables (including red/orange and dark green), meats, legumes, and grains. Visit our website to check out the current list (the School Year 2016 list will be posted soon)! Food Distribution staff will be participating in these upcoming national meetings in 2015. We look forward to these opportunities to meet you and hope to see you there! 2. Click on the red envelope on the row of social media icons on the top right of the page. 3. Enter your email address and click "Submit." Learn more at http://www.fns.usda.gov/fdd/food-distribution-programs or contact us at USDAFoods@fns.usda.gov.